Being a Waiter or Waitress or Bartender is a Profession? 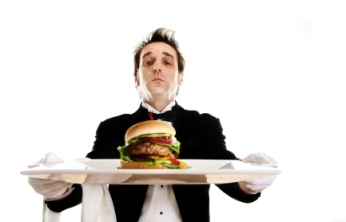 Being a Waiter or Waitress is a Profession? Being a waiter, waitress or bartender in the food and beverage industry is a profession and you are a service professional. There are only two reasons you wouldnt feel professional an appropriate title; first would be that you dont feel you have the skills to be at that level yet, or you dont think that serving tables is your profession. steps and increase as you get more confident with the subject; well this subject is different. Here you start with the biggest step, the rest is easy! As much as anyone tells you differently, this isnt rocket science. Once you have struggled over that first step the rest is an easy. Ok, Ok, get to the first step already!!!! Youve already cleared that first, and hardest step to get over. Didnt feel a thing, did you? The hardest step in becoming a service professional is two fold. First there is the drive to do it, and second is the desire to get better, and more knowledgeable about it. You wouldnt be here if you didnt have those covered! Covering your steps from there is the easy part, and a large part of our mission here. We are here to support you, to give you the tools, and to open a channel for you to contact and explore with the millions of other service professionals. If your reason for not considering yourself a service professional is thinking its not a profession Im here to tell you just how mistaken you are. There certainly wouldnt be some 13 million of you to begin with, but it goes much deeper than that! Sure, you may be going to school still, using this as a job until you get out and start making a life in the field of your choosing, but the skills and knowledge you accumulate now will be yours forever and will grant you a security like no other industry possibly can. If you are even a novice at this, you will always be able to find a job and make a wonderful living. The average income of a service professional is in excess of $35,000 a year. We are here to increase that bring home cash.